On October 17, Harmony Ridge Gallery in downtown Lewisburg will host a free mid-week Poetry Jam featuring National Poetry Slam competitor, spoken word poet, and WV-native Joe Limer. A former resident of Clarksburg and a graduate of both Fairmont State and WV University, Limer is a member of the 2012 San Diego Poetry Slam Team that made it to the semifinals of the National Poetry Slam championships this past summer in Charlotte, N.C. They are currently ranked in the top 15 such teams in the country. Unlike a poetry slam, which is a fast-paced live poetry competition, a poetry jam is simply a gathering of poets to recite their work fueled by the energy of the performances of the other poets, as well as that of the audience. Joining Limer for the poetry jam will be local poets Sarah Elkins and Tim Armentrout, who have teamed up before for local poetry recitals—most recently at a similar Harmony Ridge poetry jam during the Lewisburg Literary Festival. And accompanying the poets will be disc jockey, DJ Merrick, who will spin music throughout the jam. Sarah Elkins is a freelance writer. She lives in White Sulphur Springs with her husband, Max and son, Tad. She enjoys overcommitting herself to non-profit boards, coaching of various sorts, and cleaning missions. Poetry is cheaper than a therapist. 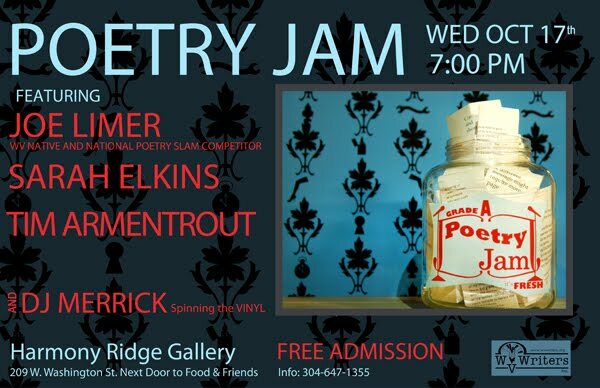 The Poetry Jam will take place October 17, starting at 7 p.m. at Harmony Ridge Gallery in downtown Lewisburg. The Poetry Jam is being cosponsored by WV Writers, Inc. The event is free and open to the public.